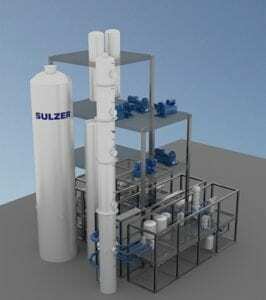 Sulzer Chemtech (Winterthur, Switzerland; www.sulzer.com) was appointed by ArcelorMittal to provide distillation equipment to its steel production plant in Gent, Belgium. This will help in converting waste gases from the steel manufacturing process into approximately 80 million liters of bioethanol annually. The EU-funded project Steelanol aims to turn carbon-rich industrial emissions into bioethanol fuels. By winning this contract, Sulzer is further strengthening its reputation in providing process engineering services and equipment for more sustainable and efficient processing plants.